If you're a fan of relaxed dressing when it comes to fashion, you'll love this extra adorable pairing of a tan fleece bomber jacket and a Federica Moretti bow detail knitted beanie hat. You could perhaps get a little creative in the footwear department and elevate your outfit with black leather ankle boots. 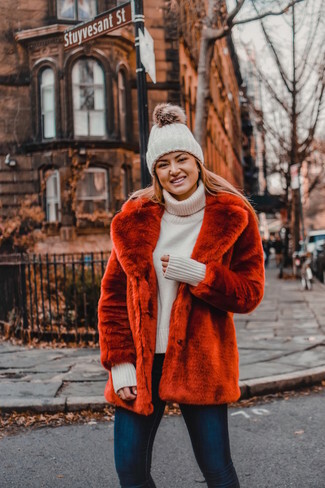 If you're obsessed with practicality dressing when it comes to your personal style, you'll love this absolutely chic pairing of a red fur jacket and a Federica Moretti bow detail knitted beanie hat. If you're a fan of comfort dressing when it comes to fashion, you'll love this super cute pairing of a beige coat and a Federica Moretti bow detail knitted beanie hat. Lift up this ensemble with tan suede knee high boots. If you're obsessed with comfort dressing when it comes to your personal style, you'll love this stylish pairing of a dark green puffer coat and a Federica Moretti bow detail knitted beanie hat from MATCHESFASHION.COM. Got bored with this outfit? Enter dark brown chunky nubuck lace-up flat boots to change things up a bit. If you're obsessed with comfort dressing when it comes to fashion, you'll love this extra adorable pairing of a pink coat and a Federica Moretti bow detail knitted beanie hat. When it comes to shoes, this outfit pairs wonderfully with pink suede low top sneakers. 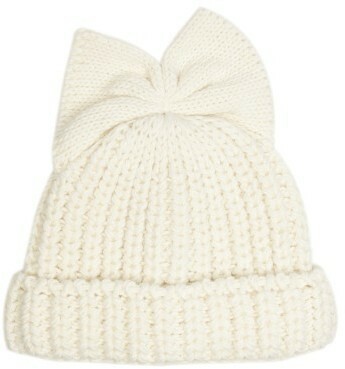 If you're all about relaxed dressing when it comes to your personal style, you'll love this totally stylish pairing of a white puffer jacket and a Federica Moretti bow detail knitted beanie hat from MATCHESFASHION.COM. If you're all about practicality dressing when it comes to fashion, you'll love this super cute pairing of a burgundy puffer coat and a Federica Moretti bow detail knitted beanie hat. If you're all about practicality dressing when it comes to your personal style, you'll love this absolutely chic pairing of a silver puffer jacket and a white knit beanie. When it comes to shoes, this ensemble is complemented nicely with silver leather high top sneakers. If you're all about relaxed dressing when it comes to your personal style, you'll love this adorable pairing of a beige shearling jacket and a Federica Moretti bow detail knitted beanie hat. Tan uggs will deliver more playfulness to your look.